The look of incredulity that sweeps over Warren Beatty’s face when interviewer ordinaire Norman Gunston explains that he has his own Tonight Show has to be seen to be believed. 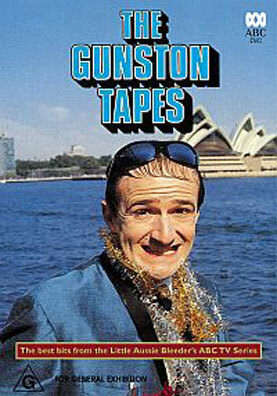 As does Gunston’s interviewing technique which pretty much set the standard for local comedy back in the 1970s. Like that other fine Australian ambassador, Dame Edna Everage, Norman Gunston revealed to the world that Aussies like a bit of a laugh…preferably at some tall poppy’s expense. Gunston was the creation of Garry McDonald and his show, written by Bill Harding and others, first went to air on the ABC in 1975 launching ‘The Little Aussie Bleeder’ with his signature comb-over, blue mod jacket and ankle freezers onto an unsuspecting audience who lapped up his incompetency’s with glee. His celebrity guests were mesmerised by the little bits of toilet paper stuck to his shaving wounds and many of them found themselves in fits of laughter at his random questions. Muhammad Ali, on the other hand, nearly punched his lights out and Frank Zapper was decidedly apprehensive until he heard Gunston unleash himself on his harmonica. But his crowning glory would have to have been arriving on the steps of Old Parliament House on November 11, 1975 when Whitlam was dismissed. Amazingly Gunston was right there in the thick of the action interviewing members of the ousted government. He subsequently put himself forward for the position of Governor General and while he didn’t win that particular post he did score a Gold Logie the following year – the first and only time the glittering prize has been awarded to a fictional character. Garry McDonald went on to win a Silver Logie for his next star turn as Arthur Beare in the ABC’s Mother and Son but no matter how far he strays, he’ll always jolt the memory bank as the fabulous fruit loop that was Norman Gunston.